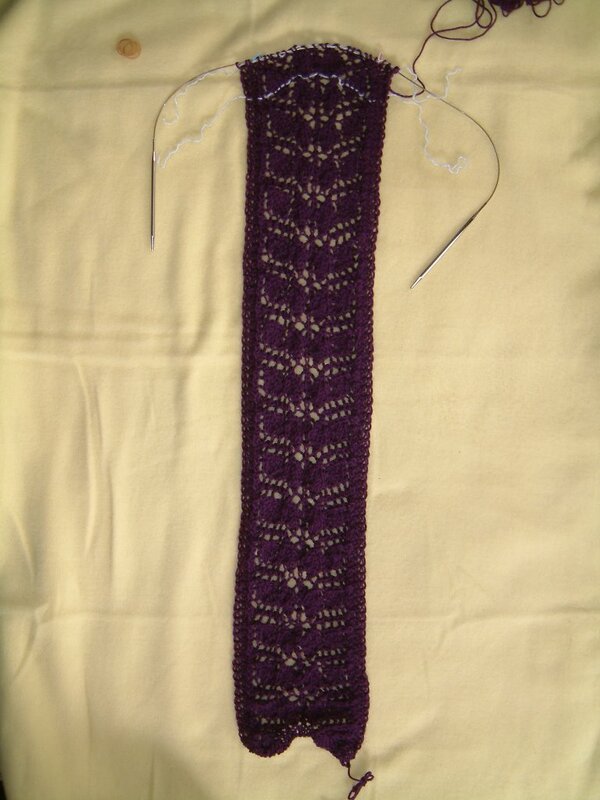 I've started Knitty's Branching Out scarf using Schoeller Stahl Hobby in a purple color; I think they call it "plum". The purple color doesn't seem to show through in the pictures; I haven't figured out why. Maybe it is the yellow background? Need to figure out how to take better pictures that show pattern detail. 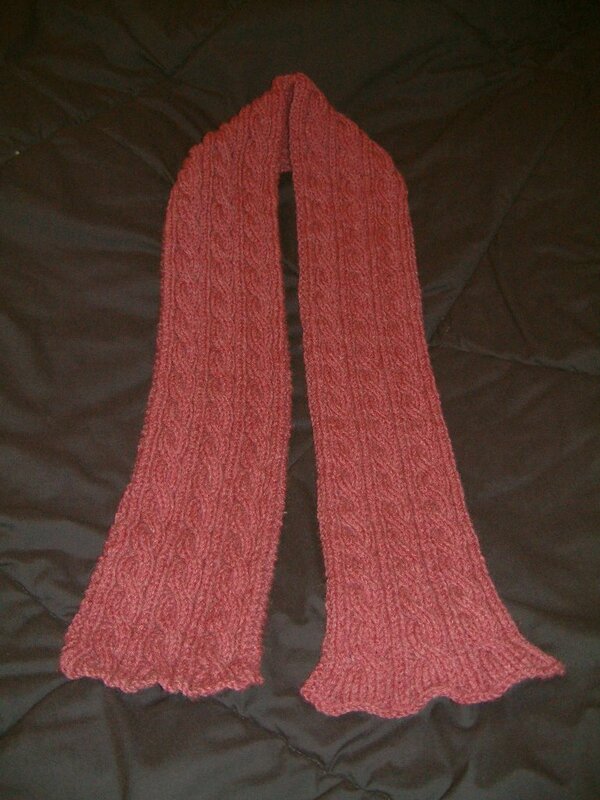 This scarf will be a gift for Sara. I always think of her as wearing green or purple, so I chose to make a purple scarf for her. 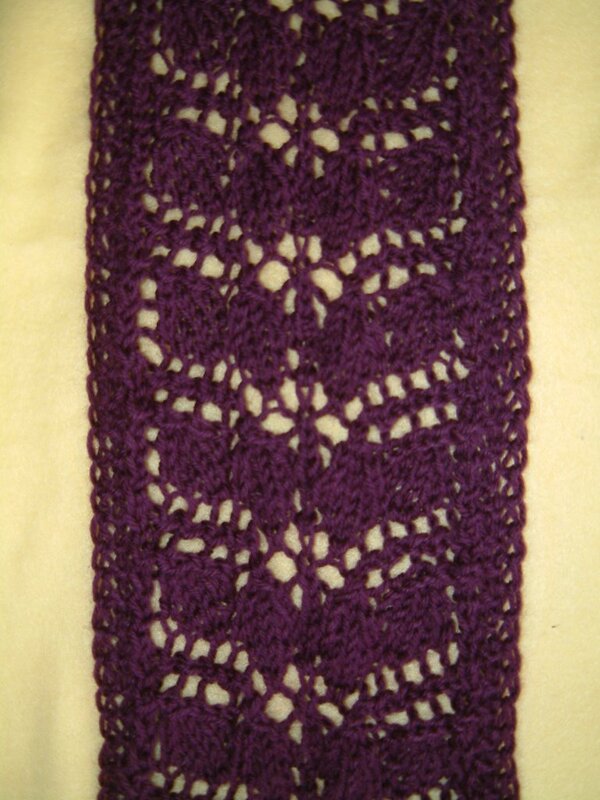 My first experience knitting "lace" was challenging. 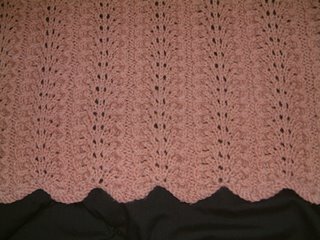 Some of those instructions were complex and it was too easy to make a mistake ... but I eventually completed (after a few months) Marisa's Baby Blanket. The blanket is a bit "heavy" because I did not choose a baby or sport yarn. 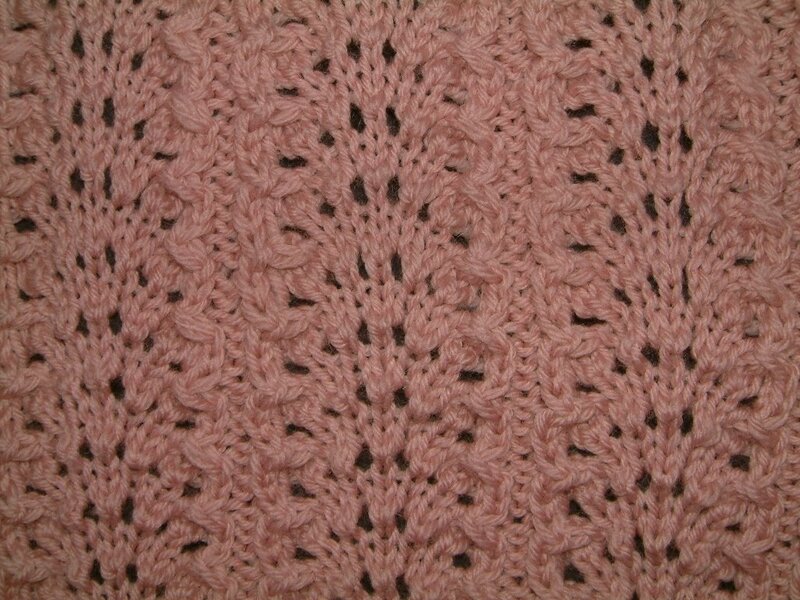 I used 11 balls of Filatura di Crosa 501 DK weight yarn in Dusky Rose with US7 (4.5mm) needles. 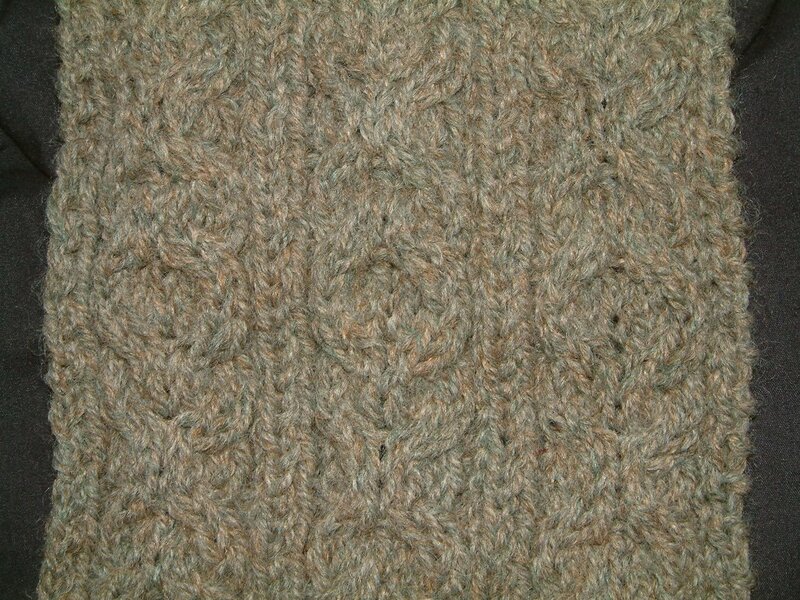 I love this yarn, it became softer after I washed it. It is a superwash wool which means it can be thrown into the washer & dryer. Great stuff! I haven't measured the blanket; I'm guessing it is about 45" square. 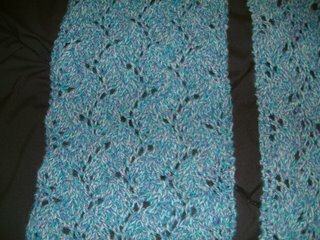 It was with this blanket that I realized how knitting is not very cost effective. I think most people assume that it is cheaper to knit stuff. The retail cost for this yarn would have been over $70. I managed to get it for $43. But anyone can get a store bought baby blanket for much less than this! 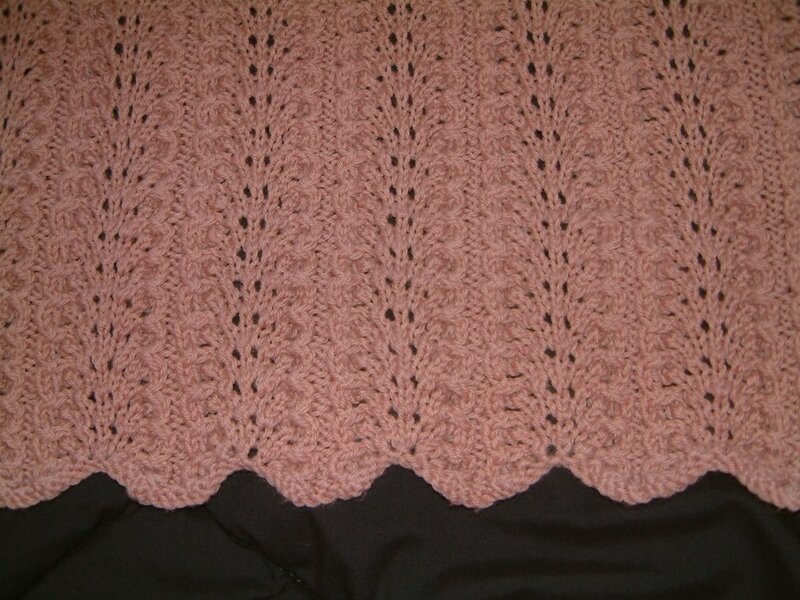 However I would not have had the pleasure of knitting this blanket if I went that route. 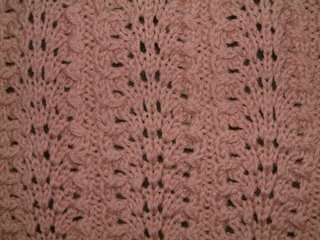 I have fond memories of knitting this blanket during a "mini vacation" in Carmel, CA in January. Marisa won't be able to use the blanket until she is 12 months old; I hope she will cherish it. 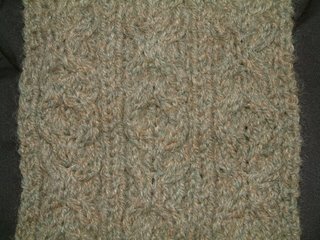 BTW, Grumperina was the one who suggested (on the Knitting Forum) that I check out the Filatura di Crosa 501 yarn that was sold on Elann. She has a great blog, Grumperina goes to local yarn shops and Home Depot. 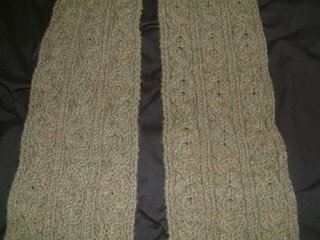 Knitting cables on the Irish Hiking Scarf was so much fun that I decided to knit another cable-intensive scarf, the Besotted Scarf. This one required a little more concentration since there are left cables and right cables. I never got the hang of doing "air" cables, so I used a cable needle throughout. 1/17/07: Edited to remove link to pattern since the target site no longer exists. 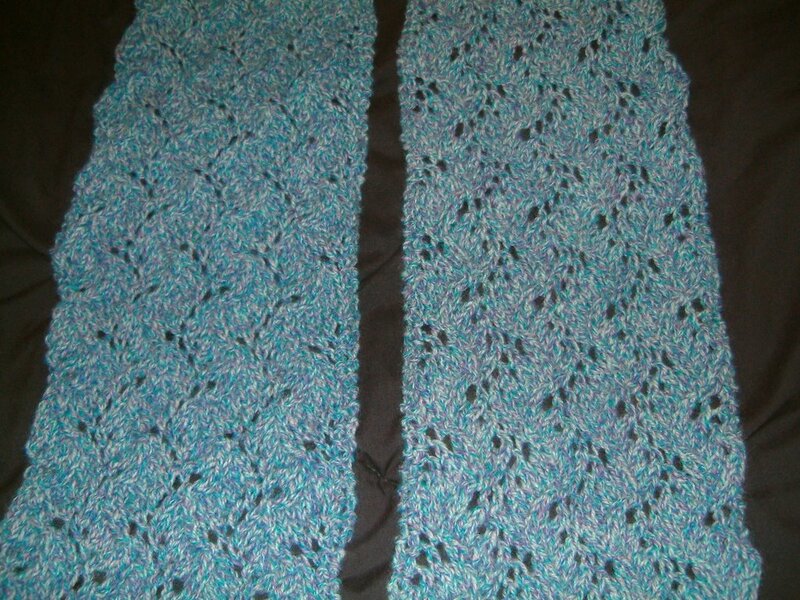 Here is the Travelling Vine scarf I completed in March. 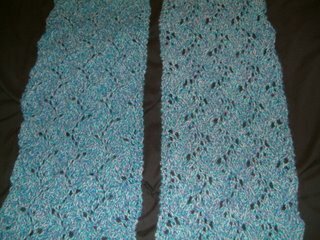 At first I didn't understand why it was called Travelling Vine ... until I completed the scarf, washed/blocked it, and then took these pictures. The pattern really shows through against the black background. I am so excited! This is my first blog ... a place for me to share what I've been working on with family & friends. 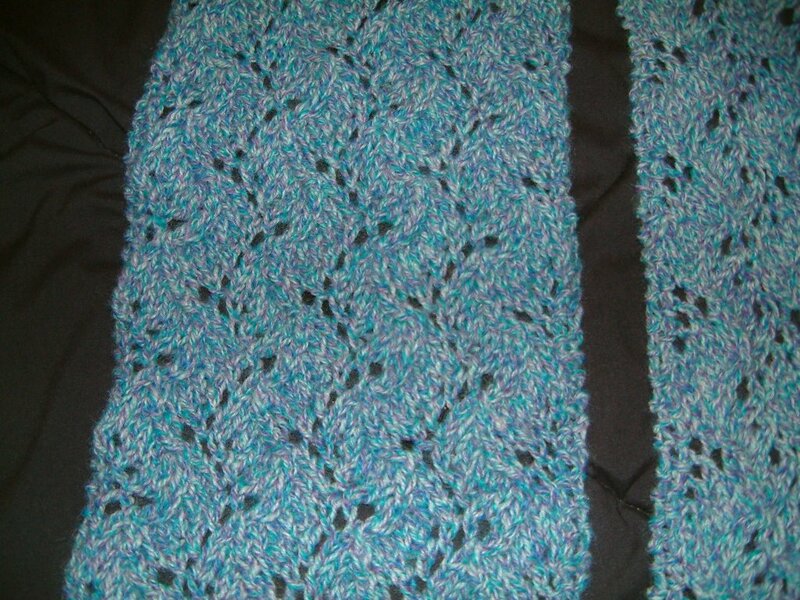 I am a knitting neophyte who just started to knit in November 2004. 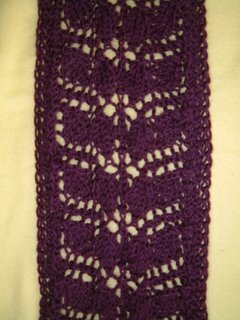 I have found it to be very relaxing, and it is something I can do while watching TV if it isn't a very complicated pattern. I have learned a lot since then, especially with the help of all those wonderful people at Knitting About.com. 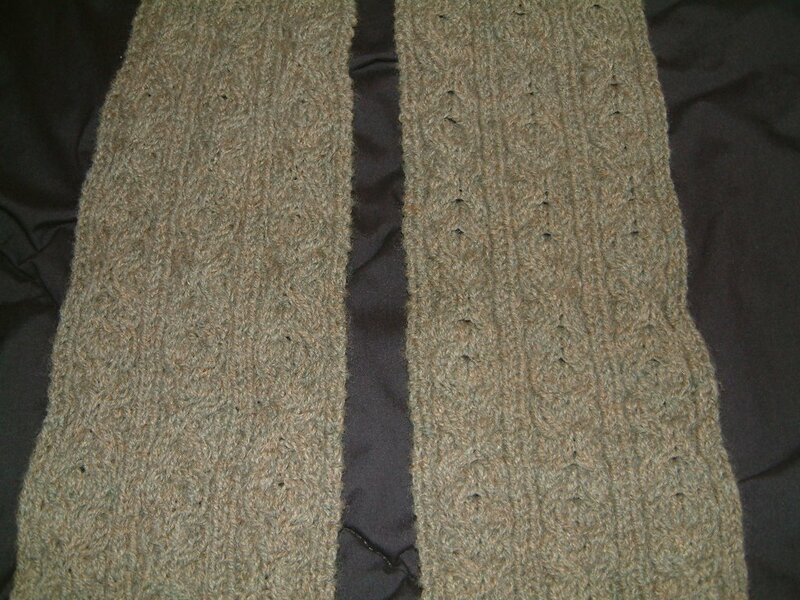 I'm going to start by posting a picture of one of my early knitting projects, the Irish Hiking Scarf. 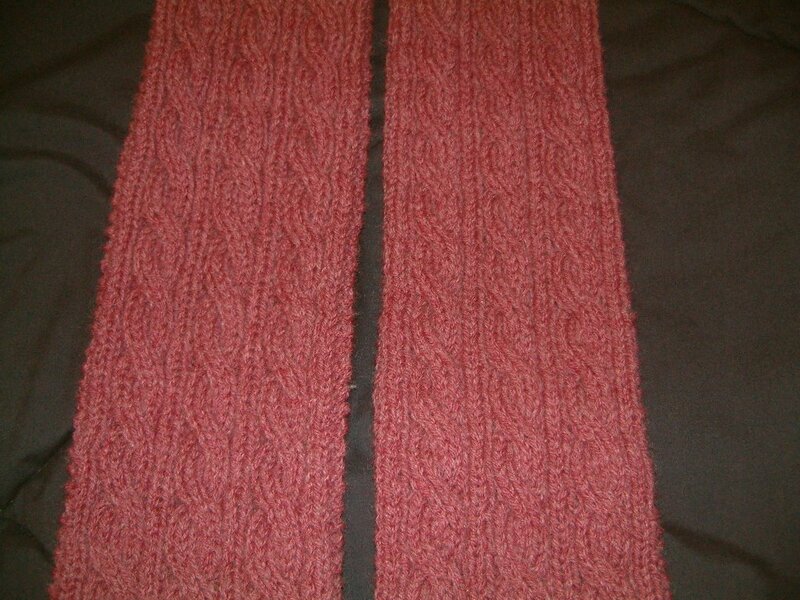 This was my first cable project. At first I thought this was going to be difficult, but it is much easier than it looks! 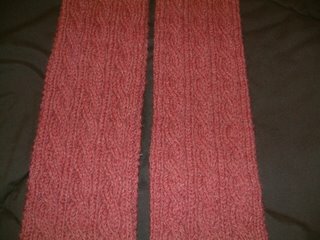 I ended up making 4 of these scarves. And I remember trying to finish one of them during a Lord of the Rings marathon just before Christmas. Let me just say that trying to watch the extended versions of all three movies over 2 days is a case of too much of a good thing. I haven't rewatched any of the movies since then.